The name is derived from the Greek 'Xenos', 'strange'. Discovered in 1898 by Ramsay and Travers in residue left after evaporating liquid air. Xenon (Xe) is a member of the so-called noble or “inert” gases. It is an inert, odourless gas and makes up 0.0000087% of the atmosphere (0.087 ppm). Xenon is not toxic, but its compounds are highly toxic because of their strong oxidizing characteristics. It is non-flammable and does not support combustion. As an anaesthetic agent Xenon is more potent than nitrous oxide with a MAC of 71%. The very low blood:gas partition coefficient (0.14), gives rapid induction and emergence. These features, plus its lack of environmental properties (unlike N2O), have led to investigations into its use in anaesthesia, despite its high cost. Its radioactive isotope 133Xe is used in estimations of organ blood flow (e.g. 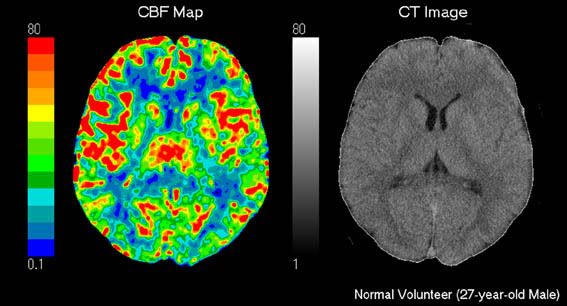 Xe computed tomography for assessment of cerebral blood flow) and in analysis of distribution of ventilation in lung perfusion/ ventilation scans. Xenon produces a beautiful blue glow when excited by an electrical discharge in a vacuum tube. Xenon is produced by the fractional distillation of air, at about 2000 times the cost of producing N2O. In contrast to other inhaled anaesthetic agents Xenon slows the respiratory rate, while the tidal volume is increased so that the minute volume remains constant. Compared with N2O, Xe has a higher density (X3) and viscosity (X1.5), which may increase airway resistance and the need for higher driving pressures during ventilation. It does not cause respiratory irritation. Despite its use at high concentrations it does not appear to result in diffusion hypoxia as seen with N2O. It is highly cardiostable with no reduction in contractility, but a small decrease in heart rate may be seen. Xenon does not sensitise the myocardium to catecholamines. It inhibits plasma membrane Ca2+ pump and inhibits NMDA in dorsal horn neurones. In humans it appears to increase cerebral blood flow in a variable manner and its use neuroanaesthesia is not recommended. Xenon has significant analgesic properties and is not a trigger for malignant hyperthermia. Xenon is not metabolised in the body and is eliminated via the lungs. [i] Cardiovascular effects of xenon and nitrous oxide in patients during fentanyl-midazolam anaesthesia. Goto T, Hanne P, Ishiguro Y, Ichinose F, Niimi Y, Morita S.
[ii] Randomized controlled trial of the haemodynamic and recovery effects of xenon or propofol anaesthesia. Coburn M, Kunitz O, Baumert JH, Hecker K, Haaf S, Zuhlsdorff A, Beeker T, Rossaint R.
[iii] Xenon, a modern anaesthesia gas. Hecker K, Baumert JH, Horn N, Rossaint R.